Oh So Good – Homemade Peanut Butter Cups! With Halloween just a day away I wanted to make something different to share with the neighborhood kids. I typically create fun cupcakes or cookies, but this year I decided to opt for large Homemade Peanut Butter Cups. 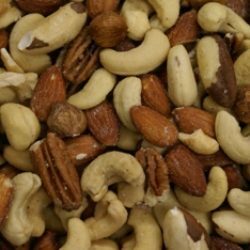 I know none of the kids have an allergy to nuts so I figured I was safe. 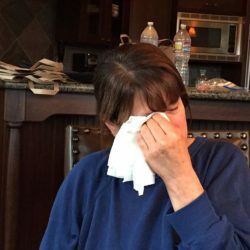 Plus my husband and daughter love them – so leftovers would certainly be eaten. These literally can be made start to finish in just 30 minutes, so if you’re looking for a quick treat to share for Halloween, these are a sure bet. Wrapped individually in cellophane bags with a ribbon – they’re sure to be a favorite among all the ghosts and goblins that knock on your door! Looking for help making these luscious Homemade Peanut Butter Cups? Enlist your kids and grandkids, they’ll love making these. 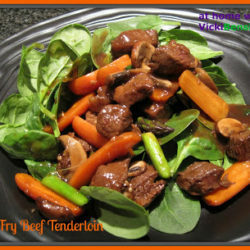 With just 4 ingredients you can make this stellar recipe! Check it out……. Peanut Butter Cups: Line 12 regular muffin cups with paper liners. Place the peanut butter and butter in a microwaveable bowl. Heat in the microwave until quite soft (approximately 40-60 seconds, checking every 20 seconds and stirring). Add in confectioners sugar and blend. Chocolate Coating: Melt the chocolate in a heatproof bowl, placed over a saucepan of simmering water. Alternatively you can also microwave the chocolate in 30 second intervals, stirring in between, but to avoid the risk over overheating the chocolate I recommend the stove top double boiler method I listed first. Spoon, or pipe, one heaping teaspoon (or small ice cream scoop) of the melted chocolate into paper cups. Tap pan gently on counter to smooth out chocolate. Spoon a teaspoon of peanut butter mixture on top and center of chocolate. Then top with another teaspoon of melted chocolate, covering the peanut butter. Tap pan gently on counter to smooth out the peanut butter cups. Refrigerate about 20 minutes or until set. Store in an airtight container in refrigerator or freeze. When ready to serve bring to room temperature or chilled. Note: Use whatever type of chocolate you prefer. Jazz it up a bit using Nutella or Bischoff Spread, if desired, in place of peanut butter. Everyone loves peanut butter cups! My husband is crazy for them. Mine too! They’re so much better made fresh and with the type of chocolate you like. Hi Vicki! YOU have given me a gift, this recipe! Now I can make these for my girls and for my grandchildren. Thank you so much again! Have a beautiful day! I’m so glad I could share this recipe with you. I hope all your children love them. Have a great day! Oh they were but thankfully I made enough because my family at most of them. Ohhh dear. My hubby and I are nuts for Reese’s peanut butter cups and these would be one heck of a treat! I love how easy they are! They are so simple you could almost make them with your eyes closed. Who knew! You don’t have to ask me twice to try this yummy treat! They look wonderful Vicki. They are, I hope you’ll try them. I love that best about cooking. You can create any dish with the ingredients you prefer. So if you like dark, white, semi-sweet or milk chocolate you can have each one in a peanut butter cup. How great is that! 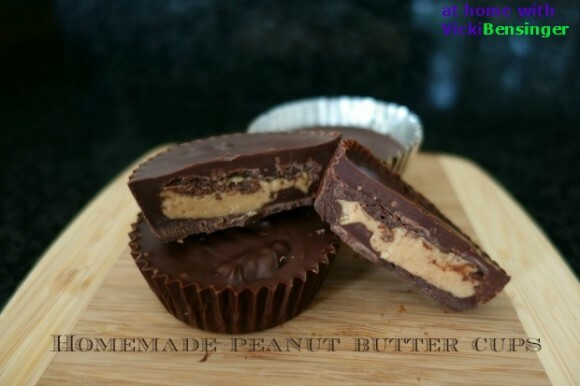 Peanut Butter Cups are one of my favorite candies, these look delicious! They were, I hope you’ll try this easy recipe. 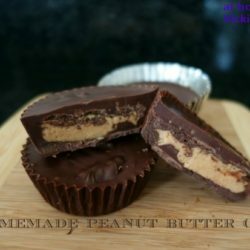 I love peanut butter cups, and the idea of homemade ones is heavenly! They are. 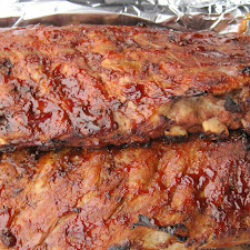 I’ve kept them in the refrigerator but you can leave them out or take them out just before serving to soften up. Yum, who would have know these were so easy to make. I think that’s a bit dangerous. 🙂 I know the kids will be thrilled with these! I know, they’re so easy. Now my family is going to be asking for these all the time. I’ve made the little version before, but your larger ones are so much more enticing! What a nice Halloween treat!!! Actually the little ones are nice. We all find that we’re cutting them in half because they’re really so rich. It’s hard difficult to eat a large on in one sitting. The mini ones are great to snack on but for gifting the large ones would definitely be nice. Yum! I love homemade candies but never attempted at PB cups. Need to change that, stat!! Definitely! They’re simple and delicious! Can’t believe I only need 4 ingredients for these babies!! Love it!! I know, they’re so easy. I hope you’ll try these. That’s so nice of you to make something sweet and share with neighborhood kids. These are actually so easy to make and with just 4 ingredients. My neighbors are use to me bringing stuff by. I make it and then my husband insists I gift it because he knows he’ll eat it all. So we have our share and typically share with the neighbors. I love to do that. It’s more fun! I hope you’ll try these. You do know that yours look better than the real thing! Bobby and I both love peanut butter cups and I can see right now that these are going to be a holiday treat this December. Thanks!! Oh yea, and you should use chocolate that’s chili flavored. That would be right up your alley. Oh please tell me what he thinks of them. How lucky your neighborhood kids are! These treats look so addictive and are perfect not only for Halloween but for many other occasions. They’re addictive but also rich. It’s difficult to eat an entire large one at one sitting. But oh are they ever yummy! You are absolutely a sweetheart to bake for the kids. I am sure they loved it, look at that goodness. I’ve never been a big fan of the store bought ones, but your version, I could gobble a couple. I hope you’ll try them. If you love PB cups you’ll love these. Great recipe, I’m going to try this! Delicious! Just feel like like grabbing one as I type. Hi, I’m Vicki Bensinger! I have been teaching culinary classes throughout Missouri since 1992. I offer personalized private culinary classes for individuals and small groups in the comfort of your home or organization. designed to provide, a means for us to earn fees by linking to Amazon.com and affiliated sites. ©2019 Vicki Bensinger. All Rights Reserved.